When Michael Seidelman was growing up, his passions were reading, watching movies, enjoying nature and creative writing. Not much has changed since then. 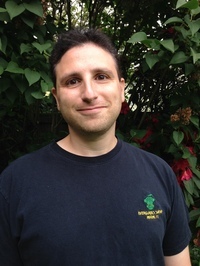 Working in Online Marketing for over ten years, Michael felt it was time to pursue his passion as a career and wrote the first book in The Garden of Syn trilogy. He is currently putting the finishing touches on the second book in The Garden of Syn series and, beyond the trilogy, has many ideas plotted out that he looks forward to sharing with the world! To ask Michael Seidelman questions, please sign up. When do you plan to have the third Syn book out? I am thrilled to announce that the second book in the Garden of Syn Trilogy - Everyone Dies in the Garden of Syn - is now available!!! This books is a true sequel so you'll get the most enjoyment out of it after reading No One Dies in the Garden of Syn. Everyone Dies in the Garden of Syn pumps up the action while introducing new mysteries and huge twists you won't see coming! We’d love your help. Let us know what’s wrong with this preview of Every Breath I Take by Claire Wineland. We’d love your help. Let us know what’s wrong with this preview of The Fall of Crazy House by James Patterson. We’d love your help. Let us know what’s wrong with this preview of No Exit by Taylor Adams. We’d love your help. Let us know what’s wrong with this preview of Crazy House by James Patterson. We’d love your help. Let us know what’s wrong with this preview of Guilty by Laura Elliot. This is like Alice in a very dark Wonderland. The author’s imagination is vivid taking you along on a twisted ride. Entertaining and wondrously imaginative, I highly recommend it. " We’d love your help. Let us know what’s wrong with this preview of No One Dies in the Garden of Syn by Michael Seidelman. We’d love your help. Let us know what’s wrong with this preview of Strange Seed by T.M. Wright. "I’ve read quite a few books on Cystic Fibrosis, fiction and non-fiction. View From The Edge is by far an absolute favourite of mine despite being a very difficult read for me.